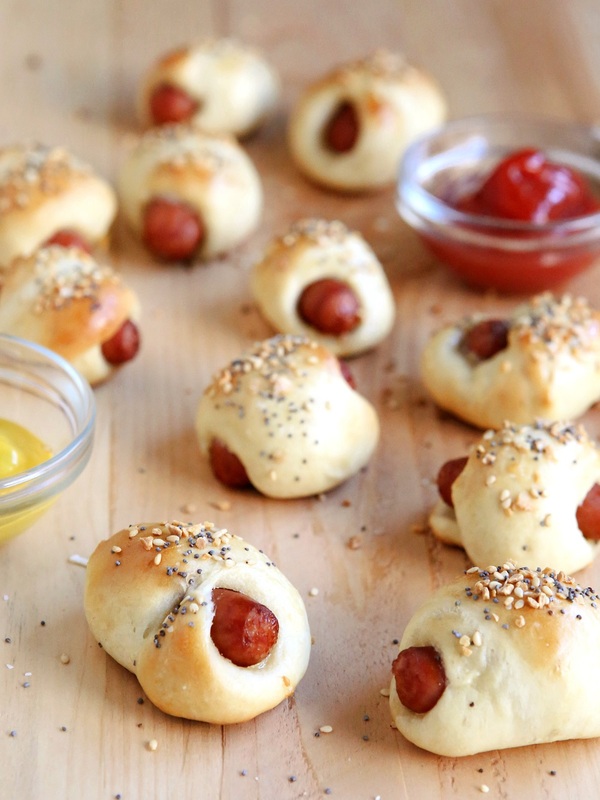 Classic sausages wrapped in a bread blanket, with a fun seasoning twist! Serve with ketchup, mustard or any other desired dipping sauce. (1) In a small saucepan set over medium low heat, warm the honey, water and butter just until butter is melted. Remove from heat and let cool for about 5 minutes, or until 120-130 degrees F.
(2) In the bowl of a stand mixer fitted with a paddle attachment, or with a wooden spoon and a large bowl, combine 2 cups of the flour, the salt and yeast. Add the honey mixture and mix until combined. Add the eggs one at a time, mixing after each. (3) With the mixer on low, add the remaining flour ¼ cup at a time until the dough clears the side of the bowl and doesn't come off on your fingers when you touch it. You may not need all 3 cups of the flour. Continue kneading dough with the dough hook or by hand until it is smooth and elastic, about 6-8 minutes. (4) Place the dough in a greased bowl, cover with plastic wrap and let rise in a warm place until doubled, about 1 hour. (5) Gently punch down the dough to release the gases, and then knead a few times by hand. Gently pinch off portions (small pieces for mini sausages and larger pieces for regular size sausages) of the dough and shape into a rope. Wrap rope around the sausage and place on a sheet pan lined with parchment paper. (6) When finished wrapping all of the sausages, cover with plastic wrap and let rise until doubled again, about 30 minutes. Meanwhile, preheat oven to 375 degrees F.
(7) To make the everything spice, combine all of the ingredients in a small bowl. Brush the dough with egg wash and sprinkle generously with everything spice. Bake until the bread is golden brown, about 12 minutes for minis and 15 minutes for regular size.